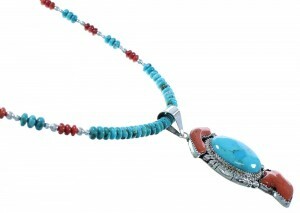 Sterling silver, real Turquoise, Coral, and Red Oyster Shell. Pendant measures approximately 3" long (including bail) and 1-1/4" at widest point. Necklace measures approximately 22-7/8" long. Pendant and necklace set weighs 54 grams. This is a very exquisite necklace set that must not be overlooked! 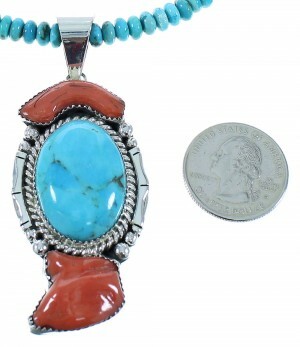 In this Native American jewelry set, the pendant is Navajo hand crafted, out of genuine sterling silver, along with a real Turquoise and real Corals. The pendant has a total of THREE stones that are carefully placed in a hand cut bezel setting, while twsited silver, mini silver beads, and hand cut silver work can be seen accenting for a perfect finish. The pendant is stamped sterling and hallmarked. 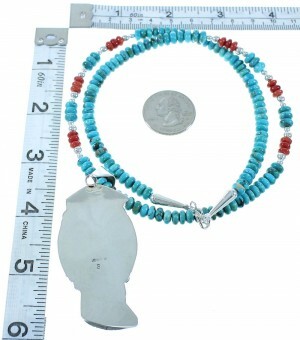 The necklace is hand strung out of genuine sterling silver, along with real Turquoise and Red Oyster Shell beads. The necklace consists of: 5-mm Red Oyster Shell rondelle beads, 6-mm Turquoise rondelle beads, along with 3-mm and 4-mm silver round beads. Each end of the necklace is completed with a silver cone and bead for a perfect finish. The cones are stamped sterling.